Edit: I withdraw the above comment. Megalomaniac points out on page 2 here that LT was set up and the holMEs quote is taken totally out of context. Apologies to LT. Just another case of a sc*mbag reporter trying to make news. Thank you Megalomaniac. LaDainian Tomlinson has openly criticized the New York Jets locker room he was a part of in 2011 after watching it fray at the end of the season. 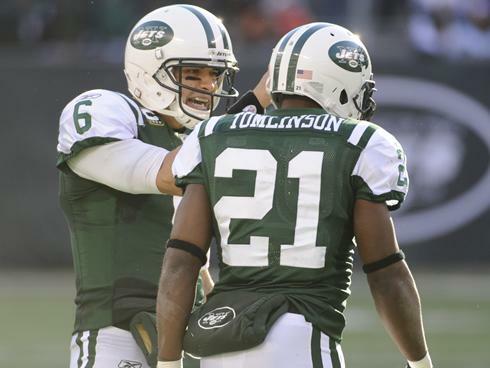 Could Jets WR Santonio Holmes again be a headache for QB Mark Sanchez (6)? Former New York RB LaDainian Tomlinson (21) thinks so. Now he's warning that Tim Tebow's arrival there could indirectly lead to more strife, specifically from WR Santonio Holmes, who's been singled out as a source of last year's fractious atmosphere. "If (by) Week 6, if they haven't thrown the ball more than 15 times a game, and Santonio is not getting his catches, you may hear some things (with) him speaking out. I hope Santonio learned from what happened last year. You have to learn from your previous mistakes," Tomlinson, now retired, said on NFL Network's The Rich Eisen Podcast on Thursday. Holmes had just 51 catches and a career-low 654 receiving yards in 2011 and vented frustration on and off the field. However Tomlinson also opined that the moody wideout might buy into a dual quarterback system knowing Tebow's running ability might serve to open things up for the offense whether he's under center or perhaps putting the Jets in down-and-distance situations that allow Mark Sanchez to make more shots in the passing game. "Mark's our quarterback," said L.T. "Tebow will be our Wildcat quarterback whenever we want to ground and pound. Santonio may be able to accept that a little bit more than playing musical chairs." His assertion that he'd rather be a Hall of Famer than a Super Bowl champion in a ProFootballTalk interview: "Ever since I was kid, I wanted to leave a mark on the game. I wanted to be special. That's something I worked for. And I understand that it's a team game, and at the end of the day, I wanted to win a championship. It's not like I was saying I didn't want to win a championship -- I wanted so badly to win a championship, I sacrificed individually so much. But when it's all said and done, at the end of the day, I didn't win a championship but I think I've got a great chance of going to the Hall of Fame. ... You're going to get various opinions about the way I did things, the way I carried myself. ... But I didn't think I was a selfish person at all." Whether running backs are still cooked at the age of 30: "Running backs don't have the same workload as I had, or Marshall Faulk had, Emmitt Smith, guys like that who carried the ball 300-plus times a year every year. And so obviously it takes a toll on your body. But today's game, where you have two- and three-running back rotations, a running back can play a lot longer now." Last edited by JetsNeedNewton; 07-14-2012 at 11:20 AM. He's just a bitter person after never winning his team(s) a championship. I think this is more stating the obvious than anything else. Holmes could definitely be a problem. There's a reason Pittsburgh let him go for practically nothing, and we saw why last season. He doesn't sound bitter at all. "Tomlinson is trying to keep his name out there." Really? That's your interpretation of this? How about acknowledging that Santonio Holmes behaves like a selfish, petulant little child. We can all hope that he uses his immense talent to help the team win, but the Jets having to cut bait with him by mid-season is just as likely. Tone is, however, almost worth the contract he received just for his part in the firing of Schitty. Almost. "If (by) Week 6, if they haven't thrown the ball more than 15 times a game, and Santonio is not getting his catches, you may hear some things (with) him speaking out. Sanchez averaged 24 attempts as a rookie, when the Jets had the #1 rushing offense and ran on over 60% of downs. Santonio can get behind guys and he loves the long home run. He had the same thing in Pittsburgh. He wants to make plays. otoh I wouldn't ever call him a hero, either. LT sounds pretty much matter -of-fact; imo the editors are drumming this into a negative story. There is nothing coming out of his mouth that says he's bitter, or highly doubtful of holmes. Yeah, that is just totally absurd. If he wants to make the claim Holmes will be unhappy with the number of looks he gets in the new offensive scheme, that's worthy of thought and discussion. But 15 atts/game? That's way off. Not for nothing but LT did not say anything that was out of line. Headline is a little misleading. He referred to the Mark as "our" QB and to the Jets as "we". Interesting. If Tebow becomes the starter, I'd be pretty mad about having him throw to me, too. If that does happen the way LT things it will, then I wouldn't blame Holmes one bit. LT really going out on a limb. People Talking About LaDainian ? This douche is warren sapp 2, in training..
"Tomlinson is trying to keep his name out there." Really? That's your interpretation of this? How about acknowledging that Santonio Holmes behaves like a selfish, petulant little child. .
B) I knew when the Jets traded for Tebow,That Mark would rise to the occassion and be the guy "him and I had talked about him being "
Just a matter of time ! On the other hand, he is now an actor trying to survive in a new job where ratings are everything. Maybe he'll some day grow into a Jenny V and understand what reporting is all about. LT is saying the same thing Cannizzaro said on JI radio about Holmes. What that he might blow up, or that he might happy and be a good teammate, or that he might be angry and hold it in? Sounds like he's got all the bases covered. That would make the most sense, but I think more than likely, LT just isn't very good at math, and/or he was nervous. He also said Tebow was a teammate, when he probably was thinking an opponent, or a colleague. Anyway, he didn't say anything derogatory. If anything, he'd be called a kool-aid drinkin homer around here.